I thought about it for a while, I had never thought about the “end goal” – in part because we are talking about a lifelong process, not an “end goal.” But I considered the options they had presented me. I see tolerance as the lowest on the list. It just about “putting-up” and ‘getting-on.” We tolerate pain. Not really a good thing in efforts to heal from pain and build beloved community. Diversity can go as far as embracing the 3-Fs, (Food, Fabric and Festivals) but breaks down when personal sacrifice is required. Diversity efforts often are reduced to photo-ops, appearance and statistics for reports. 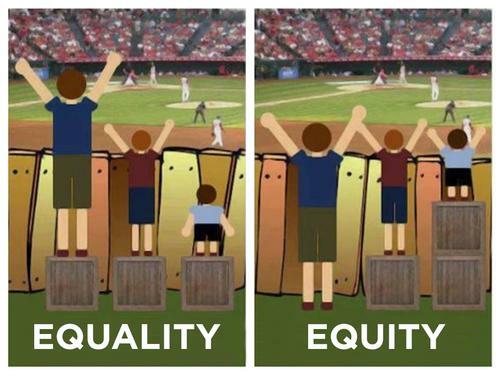 Inclusion goes further, if it really puts everyone equally at the table, yet how can you see it? Its reality can only be visualized over time if true equity begins to evolve. And finally, I realized while reconciliation is essential in the formation of Beloved Community, reconciliation cannot be limited to the warm feelings often associated with it. True reconciliation requires equity of opportunity. Reconciliation demands economic and social transformation. Disparities in Economics, Education, and Incarceration rates that still cut across our country on racial lines. Blind Denial of the roles Structural Racism and White Privilege play in the creation and perpetuation of these disparities. Anything these colleges can do around racial and cultural diversity is as empty and pointless as putting a silk dress on a pig, (a good old Iowa phrase for doing something quite difficult, but with no real purpose) if there is not also a commitment to confront the above and work towards equity. I know this sounds extreme, but if diversity efforts do not address the causes of inequity that prevent access to basic opportunities and sustain the racialized society we all have inherited, college campuses are trying to band-aid the cut without cleaning out the infection. I say this is from personal experience. I’ve witnessed and worked at schools that recruit students of color, use scholarships and marketing to persuade them to come. The schools appear diverse, they may even teach tolerance, promise inclusion and preach reconciliation. Students of color come to the University and the look good in the marketing brochures and in the reports for the accreditation associations. The School benefits from their presence, but more often than not the students suffer, many students leave before getting a degree feeling defeated and frustrated Why? No Structural Change: The school preaches welcome – but their curriculum and culture remain locked down in European- American structures that were formulated in and adapted to structural racism. Patronizing Perspective: While no one would probably admit this, University administrators, faculty, staff, donors and ever students, often adopt a view that students of color come as empty recipients, needing the resources of the school, while failing to see that students of color come with lessons and resources that the white majority structures can learn and benefit from. Shortsightedness: Schools often address surface issues (“the crisis” ie students in black face, racial graffiti, a “joke’ about lynching) but fail to clearly confront structural racism and privilege through looking into the historical roots and the present disparities that result from inequity. I considered these charts demonstrating the racially aligned poverty, wealth, education and even mortgage disparities. These are legacy tragedies we’ve inherited from past generations and unless all our institutions work to create equity and confront structural racism and racialized privilege, inequity will continue unchecked.